In Hank’s fourth book, we find him being a wonderful big brother to Emily. What she really, really wants for her birthday party is to have Ralph’s Reptile Show come to perform at her birthday party. Trouble is, Dad says Ralph is expensive. Besides, Ralph’s schedule is already booked full. When Emily slams her bedroom door shut to go inside and cry, Hank has to think of something. So he hollers in that he could have the Westside Wizard come do a show at her party instead of Ralph. Trouble is, there is no such thing as the Westside Wizard. Hank calls an emergency meeting at the clubhouse with Frankie and Ashley. Together they work out a plan for Hank to dress in disguise and perform magic tricks. Because Emily’s very favorite animals are snakes, he even works a rubber snake into his act. Throughout the story, Hank and his friends work very hard to make Emily’s birthday special. Readers will pick up on the importance of taking care of younger siblings and planning surprises for them. 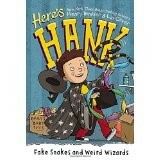 Third grade readers will also watch Hank struggle as he practices over and over again to get the tricks to work out just right. It is very rewarding to see how hard he works to make the party special. Children will understand many skills take lots of practice to succeed. Humor continues to play a large role in this Hank book, especially as the family dog is the first one to suspect who is inside the wizard costume. As with all of the Hank books, this one is printed using the Dyslexie font which makes it easier for kids with reading disabilities to distinguish the letters. However, it is not in any way intended only for children with dyslexia. This font makes it easier and faster for all children to read. They will particularly enjoy the lists Hank makes for himself, like the one about the four things that happened to him when Frankie tried to teach him magic tricks. Teachers, librarians and parents can enjoy this as a fun read aloud to share with their children and/or as a book club book to open discussions about what can or has been done to help make holidays special for siblings. After reading this book, readers will want to go to the library and read the first three Hank books, if they haven’t read them yet.